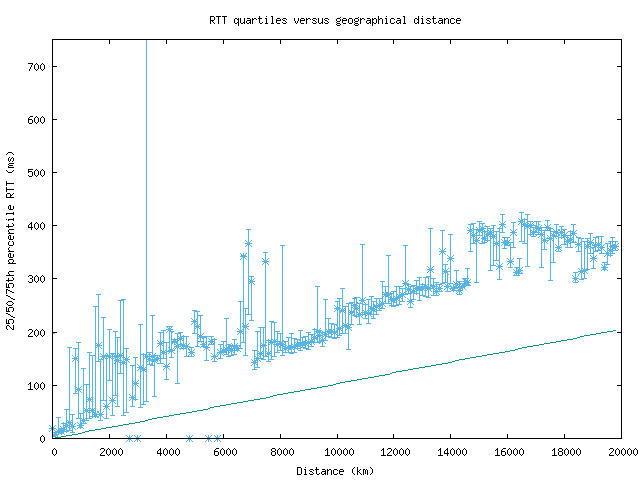 This graph shows the quartiles (25th, 50th, and 75th percentiles) of round-trip times (RTTs) versus geographical distance from the probe source. The distance is calculated by looking up every hop's latitude and longitude via NetAcuity and comparing with the location of the source. The RTTs and distances are binned (to every 3 ms and 100 km, respectively) and sorted to calculate their quartile values. The straight green line represents the theoretical best RTT (given the speed of light in fiber) for a distance. The y-axis maxes out at 750ms, because of the occasional high-RTT result which skews the graph. By comparing RTT values with distance, we can see how much that distance dominates the speed at which packets travel. The quartile view removes the outliers that show up on the density plot and presents a cleaner view of RTT values. In general, a monitor with high-speed connectivity to the rest of the Internet will have median RTTs that rise linearly with distance. Unfortunately, for distances with only a few data points, the quartile view can give confusing results, with statistically unimportant but visually impressive ranges.